Do horses see colors or are they color-blind? Have you ever wondered how horses perceive the world? Do they see it the same way as we do or maybe differently? It is quite useful for horse keepers to know whether horses can see colors so that they can use some color cues to train their horses. To answer these questions, we should turn to science and compare the anatomy of the human eye to the equine eye. What enables people and mammals to see colors are cone cells located in the retina, or the back part of the eye that sends signals to the brain where they are turned into images. The human eye has around 6 million cone cells which belong to three types depending on how they respond to different wavelengths of light. Color perception is quite complex, but, simply said, L cones are responsible for long wavelengths and red images, S cones for small wavelengths and blue images and M cones for middle wavelengths and green images. Due to the three types of cone cells, it is said that human vision is trichromatic. The horse’s eye also contains cone cells, but their number is significantly lower compared to the human eye and there are only two types of these cells. One type of equine cone cells responds to short wavelengths of light and the other type responds to middle to long wavelengths. This is why horses have dichromatic color vision. Although many people believe that horses are color-blind, the truth is different. 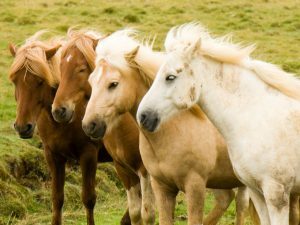 Horses can differentiate between some colors, but obviously not in the same way as humans can. In 2001, scientists at the University of Wisconsin managed to create a digital photograph that shows how a horse would perceive the world. It proved that horses can see colors, but their vision is restricted to the blue and the green ends of the spectrum. These findings are very important for those people who ride and train horses. 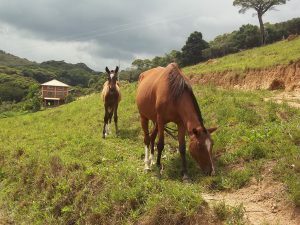 Since people and horses do not perceive the world in the same way, horses may respond to colors differently than people would expect them to. Furthermore, horses have lower visual acuity than people, so they may respond better to sounds and patterns of movement. The best way to understand equine vision is to imagine the vision of a nearsighted dichromatic person.